In Another Place  is a celebration of contemporary art produced and presented by venues in the East Midlands. 10 regional organisations have invited visual artists to present original artworks on advertising billboards in a range of locations for 6 weeks. Transforming these everyday hoardings into a vibrant display across the region, In Another Place aims to bring art to audiences, in places where normally they would see advertising. In Another Place is a collaboration between the Contemporary Visual Arts Network East Midlands and ten venues bringing new art to new audiences. Attenborough Arts Centre premiers Amartey Golding’s largest solo show to date, offering an honest & self-implicating observation on contemporary British culture. Free, drop-in activities exploring themes, materials, and ideas from the exhibition suitable for all ages and abilities. Everyone is welcome, booking is advised. Inspired by the unique characteristics of the Caucasus, this exhibition attempts to region between Europe & Asia , this exhibition attempts to reactivate transnational ideas, behaviours & thought-processes, between Eastern & Western identities. Featuring work by In Another Place artist & BACKLIT studio holder Ryan Heath. In Another Place artist, Ryan Heath will be joined by BACKLIT director Matthew Chesney for a walk & talk around the gallery & to his billboard by Nottingham Ice Stadium to discuss his work in relation to language & symbology. In Another Place collective, CommonAs presents a series of artworks in Gunby’s Orchard Gallery made with the participation of artists, National Trust volunteers & staff to celebrate, entertain, engage & prompt questions. 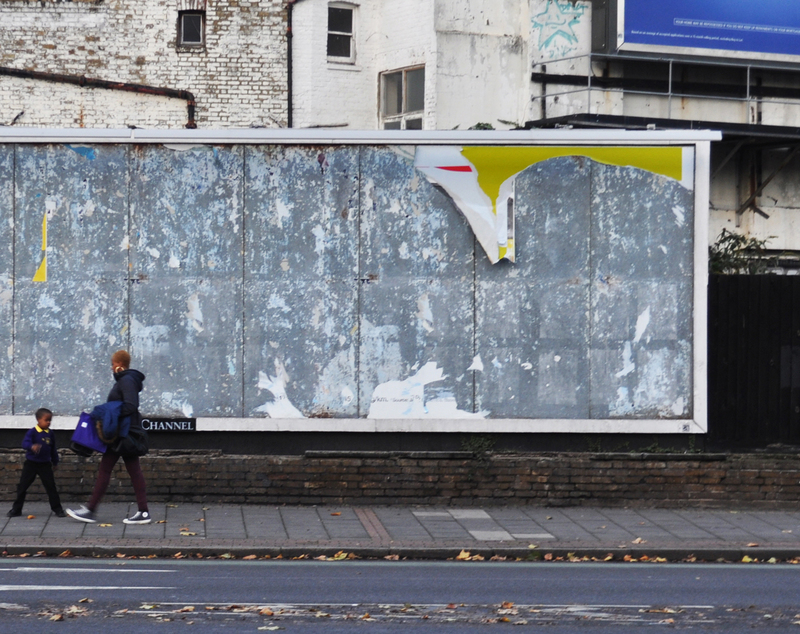 LPW presents new work by Phil Hackett, Khush Kali, Theo Miller, Emma Powell & Matt Strong, responding to our billboard’s context in Oadby & the aesthetics & ubiquity of advertising. Exhibition by In Another Place artist Theo Miller presenting a series of new works inspired & informed by his Print Futures 2017 award. In Another Place artist, Theo Miller talks about his new letterpress work, Norderstedt, showing simultaneously at LPW and on a billboard in Oadby’s Asda car park. An exhibition of work by South African visual activist Zanele Muholi, whose work presents critical questions about social justice, human rights & contested representations of the black body. Director Campbell X’s recently made documentary film, VISIBLE, challenges common misconceptions that LGBTQ+ People of Colour have no history & no story to tell. Senior Curator & Head of Archive & Research at Autograph ABP, Renée Mussai, leads a tour of In Another Place artist Zanele Muholi’s ongoing self-portrait series. Writer, critic & curator Ekow Eshun explores the cultural context of the work of In Another Place artist Zanele Muholi: a contemporary Africa where history & modernity, the personal and political exist in vivid tension. NN presents the work of In Another Place artist Dylan Fox in his first solo show in his hometown, which explores the physical, medical, emotional & social aspects of gender transition. In Another Place artist Melanie Jackson in conversation with writer Bianca Stoppani, exploring the overlap between art, technology & advertising. A major exhibition by In Another Place artist Joey Holder, investigating the construction of belief in online networks, examining the rise of unjust ideologies & fantasies, & how these are capable of affecting our worldview. In Another Place & exhibiting artist Joey Holder leads a discussion with QUAD over 50s group GoldsQUAD on the influence of the internet. The Collection presents the work of artist Mandy Lee Jandrell, which takes aerial surveillance photography as a key reference point. She is interested in the way that photographs, which on one hand serve to mimic the functionality of the eye, also serve to trick our visual perception. Drop in making sessions for years 7+ to inspired by the development of the aircraft industry in Lincoln in World War One & to celebrate the Centenary of the RAF. In Another Place  artistt Charlie Birtles leads a workshop exploring the needle lace techniques she used in her billboard artwork. Includes a visit to her billboard nearby where she will talk through the story behind the work. Tuesday 5th June, 3 – 4pm. In Another Place  artist Charlie Birtles maps her journey post-study to life as a self-employed maker for artists, students and members of the public. Followed by a visit to the billboard in Hyson Green led by the artist.